The UK's number one forest adventure. Living life a little more adventurously, and get in touch with your inner Tarzan. Fy down the zip-wires, leap off the Tarzan Swing and tackle the crossings. If you have not come across us, Go Ape's the UK'S number one forest adventure. 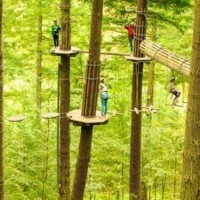 The classic Go Ape experience is a 2 – 3 hour activity. The instructors will brief you for safety before you fly down the zip-wires, leap off the Tarzan Swing and tackle the crossings. There are 28 Go Ape adventures around the country, all set in some of Britain’s most stunning forests. No two of the Go Ape Tree-Top Adventures are the same, and some locations also offer other outdoor activities like tree top Junior courses for kids and the brilliant Forest Segway Experience. The Grizedale Forest Go Ape is home to the very first Zip Wire Adventure.The course is a network of seven tandem zip lines that traverse the sky-scraping Douglas Firs at Grizedale Forest. Zip Trekking Adventure is an experience you’ll never forget. The popular Segway experience has now landed at ten of the Go Ape adventures UK wide! You can go off exploring the forest on the latest in green technology – a self-balancing electric segway.